An AllJoyn® development toolkit to quick-start AllJoyn® development. 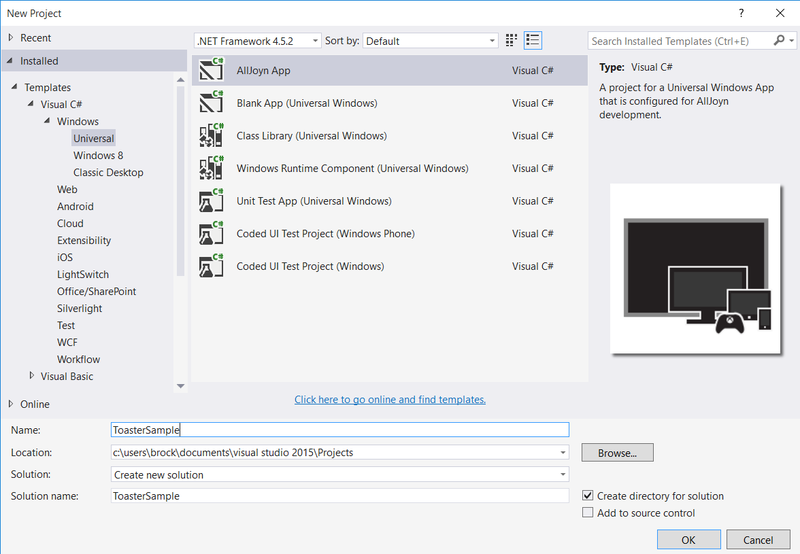 *AllJoyn Studio can only be installed to Visual Studio 2015. The AllSeen Alliance created AllJoyn® to empower the Internet of Things to transcend devices, ecosystems and the "walled gardens" that typically limit interoperability to devices within a product family. Windows® 10 has AllJoyn® built natively into its platform, allowing developers to easily IoT-enable their apps and devices. 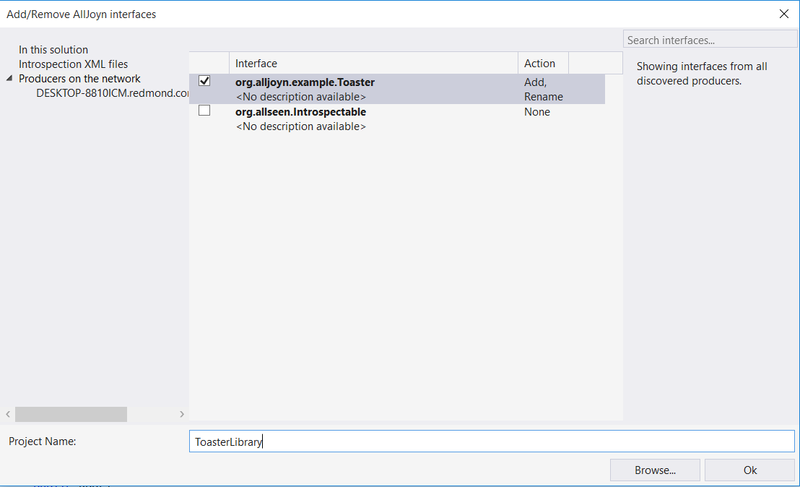 Notably, Windows® 10 provides an AllJoyn® WinRT API, and an AllJoyn® code generator is included in the Windows® 10 SDK. Together, these enable intuitive interaction with AllJoyn®-enabled devices. AllJoyn® Studio accelerates AllJoyn® development by combining code generation and the WinRT API with automated project management and ready-made application templates. It allows developers to benefit from the power of AllJoyn without the hassle of set-up and configuration. To discover AllJoyn® devices, you must be connected to a network that is marked 'Private' in Windows®, or have otherwise configured your firewall settings to allow AllJoyn® communication. If using Windows® 7 or 8.1, you will need access to a Windows® 10 device or emulator to remotely deploy your applications to. Windows® 7 and 8.1 do not support Universal Windows® applications. If you need to generate code compatible with Windows 10 Version 1507 and Windows 10 Version 1511, download the previous version of AllJoyn® Studio from the Microsoft Download Center: https://www.microsoft.com/en-us/download/details.aspx?id=54094.